When homeowners in the Grand Forks area need home comfort service, there’s no question about who they turn to—it’s Kolenda Heating & Cooling. Why? Because our service simply can’t be beat. From a brand-new furnace or air conditioner installation or repair to indoor air quality assessments, our professional technicians do it all with care and attention to detail. Customers know us as the friendly, reliable HVAC company. We’re there when you need us and deliver our absolute best service every time. We’re proud to install and stand behind Bryant® products, and service all other makes and models of furnaces and air conditioners. Next time you’re due for service, give us a try and see why homeowners throughout the area recommend us to their friends and family. Our service area includes Northwood, Mekinock, Larimore, Thompson, and the greater Grand Forks County area. No matter the size of your home and budget, we’re here and ready to help—just call 701-213-7875 or contact us. We service all makes and models of heating systems. We’re proud to sell and install only Bryant, a top rated brand in the HVAC industry. Bryant gas furnaces were recently named as the most reliable by a leading consumer magazine. And when you team the most reliable brand with the area’s most reliable dealer, you get 100 percent satisfaction—guaranteed! We can recommend the right heating system for your home and budget. With Bryant’s off-the-charts energy efficiency, you could save up to 30 percent on your home heating bills this winter, and keep on saving for years to come. We take great care to design the right comfort system for every customer. 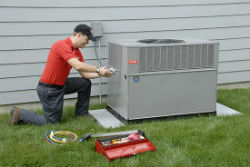 It is very important that air conditioners and heat pumps be sized and installed properly. Since every customer and installation is unique, it is our job to work with you to design a system that delivers all the comfort and cost-saving benefits you expect. To schedule a free, no-obligation, in-home consultation, message us or call us at 701-213-7875, and we′ll be happy to design the right cooling solution for you. Every family deserves clean, fresh indoor air. But pollutants–even the ones we can’t see–make their way into our homes every day. And some pollutants like dust, pollen, pet dander, mold, viruses, and bacteria can be dangerous to your family’s health. According to the EPA, research has shown that indoor air may be up to 100 times more polluted than outside air. We offer a wide range of air quality solutions you can count on to help you breathe easier and alleviate respiratory problems. Learn more about indoor air quality and what you can do to improve yours.